There are 3 females in our house and we all love our bath treats and in particular bath bombs. I use them with every bath but now find that my girls also want to use them. The problem with most shop bought bath bombs is that they contain various chemicals which could irritate young and sensitive skin, but there are bath bombs out there that are made with more natural ingredients and therefore more suited to younger skin. 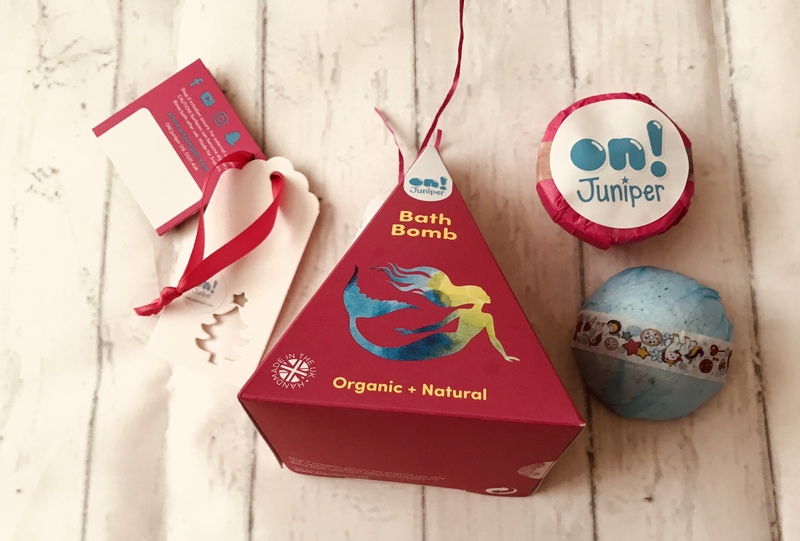 We were sent these lovely bath goodies from On Juniper. It’s a small company based in Surrey and they create and sell bath bombs and lip balms for children. The orange coloured bath bomb actually had a little surprise hidden inside it. This could be an eraser or sharpener and in our bath bomb it was a cute penguin eraser. This is hidden very well inside the bath bomb and so it has to dissolve and fizz away before it’s found. These cost £4.50 each. Inside the pretty mermaid box were two more coloured bath bombs. These are the super colour bombs which tint the water. Izebella really enjoys watching the water change colour and these cost £2.50 each. The colourant is of course made with natural products just like all the other products they make.